I can’t say I’ve gotten everywhere I wanted to during this Part 2 of Otzma (sorry southerners), but I did get up to Kiryat Shmona this past weekend. My roommate Tom and I traveled up north to visit our friends who live in K-Shmo, San Francisco’s partnership community, located just five kilometers south of the Israeli/Lebanese border. We had the good fortunes to visit during a weekend with great weather to be outdoors—sunny and about 70 degrees, and we took advantage of those conditions. On Friday, our fellow Otzmanik Jeremy led a group of 9 of us from the program on a hike through Tel Hai National Park and up the Naftali Mountains. 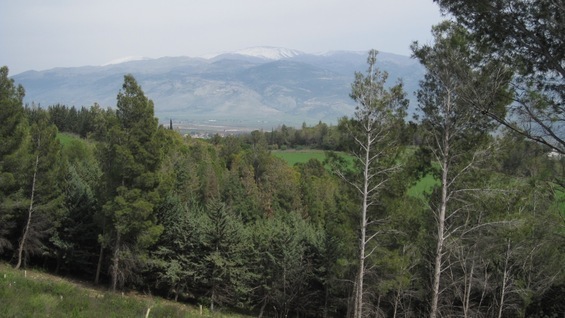 As we hiked, we took in the beautiful views—the city of Kiryat Shmona directly below us, the entire Hula Valley and the Golan Heights to the east, and the still snow-capped Hermon range to the north. All the grassy fields we walked by were green, thanks to the rainfall from the previous weekend (rain which brought the water level in the Kinneret back over the “red” emergency line). The one depressing thing was seeing the remains of cut-down trees that were hit by Katyusha rockets fired by Hezbollah. Over 1,000 of the 4,000-plus Katyushas fired by Hezbollah during the Second Lebanon War fell in Kiryat Shmona. We had a very nice Shabbat dinner, as we split up between Jeremy’s host family and Yael’s co-worker and her family…as always, there was no shortage of delicious food and good company. We were in for another fun but challenging adventure on Shabbat, as we walked all the way from K-Shmo to the Jordan River, about a 4-mile walk each direction. Along the way, we enjoyed more of the surrounding scenery, including a huge wheat field featuring Israeli irrigation technology and a gorgeous view of the western Golan. When we got to the Jordan, we passed by several groups of people sitting and relaxing along the banks of the river, enjoying the day the same way we were. Israelis—religious and secular alike—feel such a strong connection to the land, evidenced by their love of hiking and exploring the country. It’s a great feeling to be able to join them in exploring and getting to know this amazing land, whose topography includes such a diverse range of mountains, hills, and valleys stretching from Metulla and the Hermon in the North to Eilat and the Arava Mountains in the South. Here in Haifa, we’re gearing up for the Joint Steering Committee meeting of the Haifa/Boston Connection starting on Sunday. I’m looking forward to this meeting to see how the two sides of the partnership come together and how each is planning to go forward with their respective programs.